Do you have a small area for a garden and want a way to grow as many plants as possible? 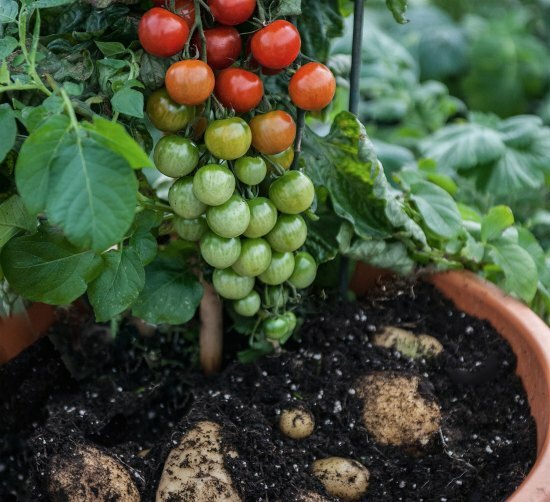 One idea to consider is how to grow tomatoes and potatoes on the same plant. This is what’ known as the the “Ketchup n Fries” hybrid plant, and you can read about the combo plants’ history here. The process to grow tomatoes and potatoes on the same plant is not difficult to do. All you will need to do is learn how to graft plants to produce the crops you need. One thing to keep in mind is you will have a lower crop yield to harvest. All you need is a small bucket or one-gallon container. You need to follow specific steps to successfully grow tomatoes and potatoes on the same plant. This is a task that involves some cutting and binding with grafting tape. The result of your effort is a plant that will produce a healthy crop of yummy tomatoes and potatoes.